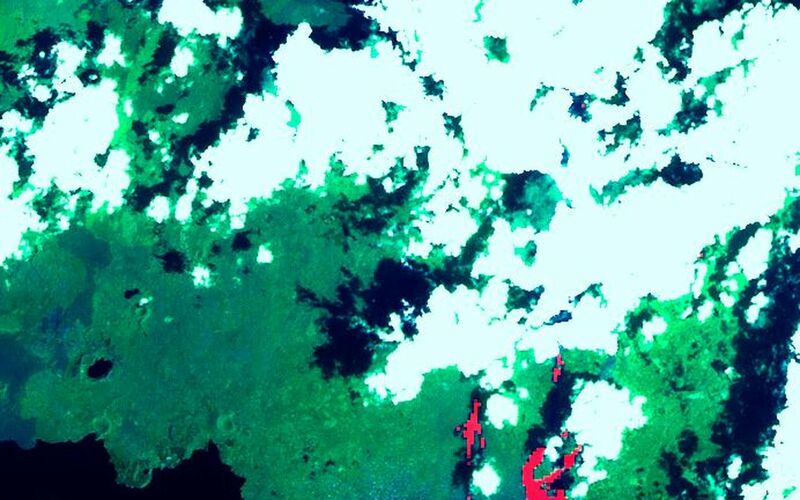 This image of the Nyiragonga volcano eruption in the Congo was acquired on January 28, 2002 by the Advanced Spaceborne Thermal Emission and Reflection Radiometer (ASTER) on NASA's Terra satellite. 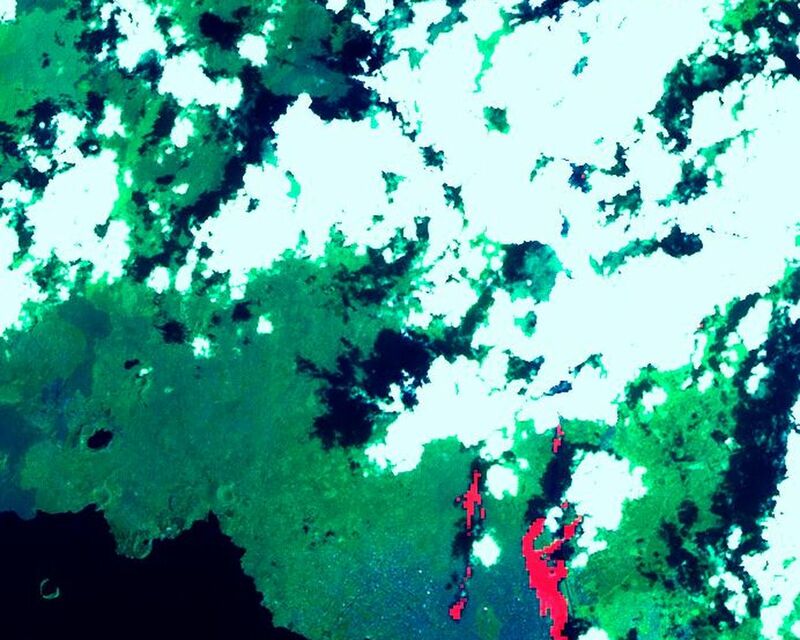 With its 14spectral bands from the visible to the thermal infrared wavelength region, and its high spatial resolution of 15 to 90 meters about 50 to 300 feet ), ASTER will image Earth for the next 6 years to map and monitor the changing surface of our planet. Image: A river of molten rock poured from the Nyiragongo volcano in the Congo on January 18, 2002, a day after it erupted, killing dozens, swallowing buildings and forcing hundreds of thousands to flee the town of Goma. The flow continued into Lake Kivu. The lave flows are depicted in red on the image indicating they are still hot. Two of them flowed south form the volcano's summit and went through the town of Goma. Another flow can be seen at the top of the image, flowing towards the northwest. One of Africa's most notable volcanoes, Nyiragongo contained an active lava lake in its deep summit crater that drained catastrophically through its outer flanks in 1977. Extremely fluid, fast-moving lava flows draining from the summit lava lake in 1977 killed 50 to 100 people, and several villages were destroyed. 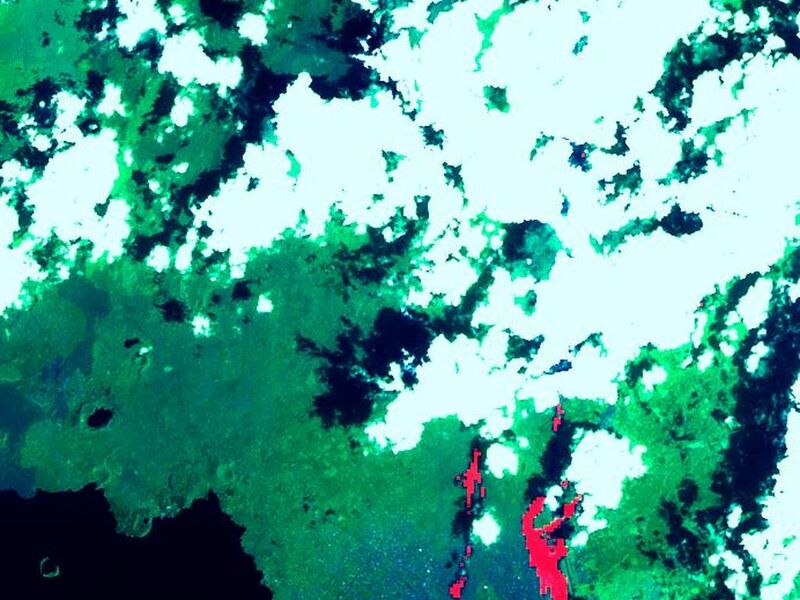 The image covers an area of 21 x 24 km and combines a thermal band in red, and two infrared bands in green and blue. Advanced Spaceborne Thermal Emission and Reflection Radiometer (ASTER) is one of five Earth-observing instruments launched December 18, 1999, on NASA's Terra satellite. The instrument was built by Japan's Ministry of International Trade and Industry. A joint U.S./Japan science team is responsible for validation and calibration of the instrument and the data products. Dr. Anne Kahle at NASA's Jet Propulsion Laboratory, Pasadena, California, is the U.S. Science team leader; Moshe Pniel of JPL is the project manager. 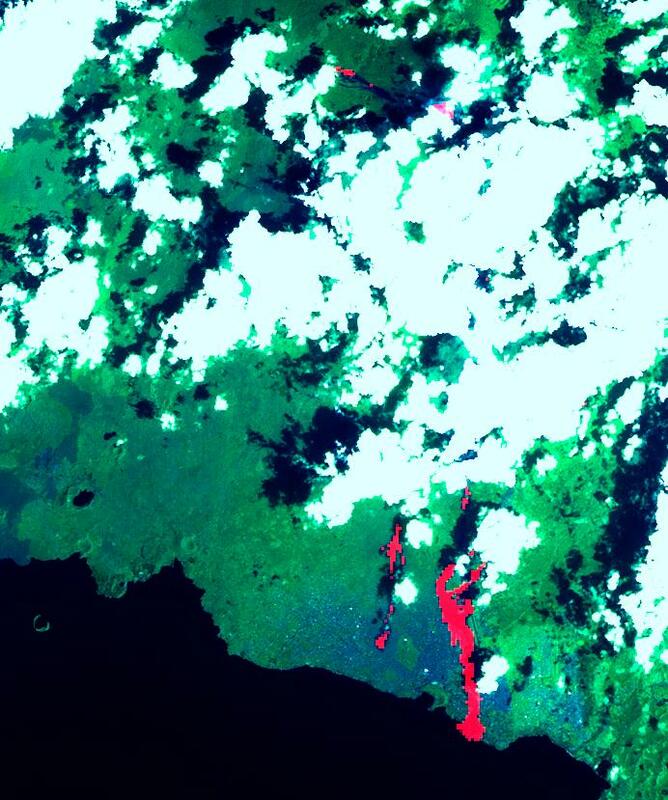 ASTER is the only high resolution imaging sensor on Terra. The primary goal of the ASTER mission is to obtain high-resolution image data in 14 channels over the entire land surface, as well as black and white stereo images. With revisit time of between 4 and 16 days, ASTER will provide the capability for repeat coverage of changing areas on Earth's surface.